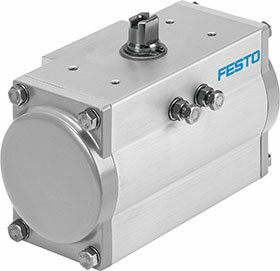 Thanks to its versatility and flexibility, Festo’s quarter-turn actuator DFPD can be used in a variety of applications. Its modern, simple and compact design impresses whether it is used with ball valves, shut off valves or air dampers in the pharmaceutical or beverage industry or for water treatment and other areas of process automation. The single-acting version of the new actuator is particularly compact and extremely modular. Due to its optimised design it can be configured in increments of 0,5 bar for more effective use. With nine different spring combinations, the DFPD meets the most precise operating pressure requirements between two and six bar. The rotation angle for the standard size is up to 90° and for the sizes 40, 120, 240 and 480, it rises to 180°. The basic version of the DFPD is suitable for temperatures between -20 and 180°C. The low temperature variant is designed for arctic regions and covers a temperature range of -50 to 60°C. The high temperature variant can be used at temperatures between 0 and 150°C. With its versatile and corrosion-resistant surface coating, the actuator can also be reliably and flexibly used in harsh conditions. It can be mounted anywhere and the end positions can be adjusted, both ends enduring high flexibility during operation. In combination with the CMSX positioner, the actuator is suited for analog control in dosing tasks. Furthermore, the sensor boxes SRBC/SRBE/SRBG enable simple digital control and full position sensing, which is possible outdoors as well as in potentially explosive environments.